 I set out on a mission with an empty stomach and an open mind with one goal: to find the best shrimp burger in the area and to relay that information. 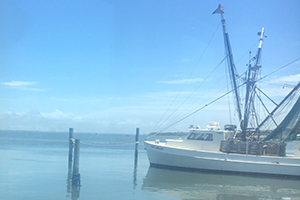 There are many great restaurants on the Crystal Coast, but I limited myself to five: Captain’s Kitchen, Big Oak Drive-In, Crab Shack, El’s Drive-In, and Bogue House. Unfortunately, I’m not a fan of coleslaw and tartar sauce. My ratings are based solely on the bread, the shrimp, and the customer service. Prior to this quest for the best, I had never had a shrimp burger. I told myself there was no way they could taste any different from each other, but I was completely wrong. Due to my lack of experience eating shrimp burgers, I had no idea where to get one. I turned to my fellow coworkers for advice on where to get a shrimp burger and which place they favored. 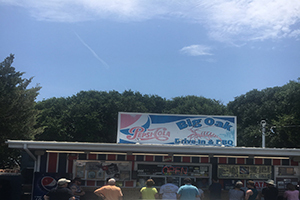 A whopping 12 people claimed that Big Oak was the best, there was a four-way tie between Captain’s Kitchen, Crab Shack, El’s Drive in, and Flipperz. Bogue House had two recommendations. I figured Big Oak would be the best—but Captain’s Kitchen/the new kid on the block took home the win for me. But don’t take my word for it! Go out there and get one! This food truck was absolutely poppin’ when I arrived! The man that greeted me once I got to the front of the line was very friendly and had a grin on his face. There were at least five people lined up ahead of me, but the service was fantastic. I didn’t have to wait more than three minutes for my burger. The burger was awesome. I’d have to say it was my favorite. I was told that the shrimp they use is locally caught. The shrimp was battered very well, and probably the freshest tasting of all the shrimp I tried. I loved how packed it was with shrimp! You should have seen the line here! I have never seen such a crowded parking lot at a food establishment. Big Oak Drive In is just a little brick shack in Salter Path. 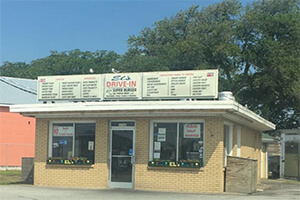 Being a drive-in, you park, walk up to the window and order, a server writes your name on a white paper bag and you hang out under the big oak trees until your name is called. The service was good, but it took a while for me to get my food. Many customers cleverly called in their order prior to their arrival. As crowded as Big Oak was, on the day I was there, someone was directing traffic, so there was no problem parking or getting out of the driveway. By the time I got home, my burger was still very warm. The shrimp were a decent size, and I could taste a hint of butter in the bread. Big Oak is a close second to Captain’s Kitchen in my book. The key is to remember cash; they do not accept credit cards. I was greeted warmly at the Crab Shack. I was led to my table in a flash. I had the nicest waitress, Allison, who sat me at a table right next to a window. I had a beautiful view of the water. There are windows all around the restaurant so that guests get a great view of the Sound. I was given a free entrée of hush puppies, which were delicious! The shrimp burger was average in size, but it was thick with shrimp that were larger than what I had experienced at other restaurants. The shrimp was warm and looked deveined. I especially enjoyed the buttery tasting bun at this restaurant. A few days after having my first shrimp burger at Crab Shack, I decided to come back a couple times. Allison has been my waitress three times now! My boyfriend tried his first shrimp burger at Crab Shack—he was impressed. I entered Bogue House and was quickly greeted by a cashier at the front desk. She took my take out order, and I only had to wait about five minutes to get my burger. The burger itself was a good portion, the shrimp tasted fresh, and was served at a good temperature. This family-owned business is definitely recommended for your next vacation to the Crystal Coast and if you’re planning on having a large family gathering at your Emerald Isle vacation rental, they also provide catering! It was a very cool experience to have waitstaff come right up to my car. I didn’t have to move a muscle! I was greeted by a very kind waitress. She walked out to my car with a big smile on her face and assured me my burger would be out shortly. So many people have told me great things about El’s Drive In. Maybe my expectations were too high, but I think the burger overall was simply good. The waitress told me I should get everything on it next time, but coleslaw and tartar sauce are not my favorite. “I don’t like coleslaw or that sauce either,” admitted the waitress. The shrimp wasn’t my favorite, but the experience was.